Ikoma-san, Shiji-san, Uchida-san, Miyaji-san had their research presentations at CREST workshop in NAIST. Our lab organized the 54th SEST meeting at Toki-messe. Uchida-san, Shoji-san, Kudo-san presented their research works. Prof. Stefan Weber and Yung Wei Chang visited our lab. They gave a lecture at CIA workshop. Prof. Jonathan.R.Woodward of Tokyo university visited our lab and took a intensive class of 'Chemistry Today Ⅰ'. Prof. Yamada of Nata institute of science and technology gave a lecture about solar cell. Dr. Chia-Jung Tsai of national tsing hua university came to our lab and gave a lecture. Four B4 and one M1 students have joined into our lab. Four B4 and two M1 students have joined into our lab. Kana-san andAmbe-san had good research presentations at Niigata Global Graduate Research Forum. We had new-year welcome party for Miura-san and Furukawa-san at Hananoya. 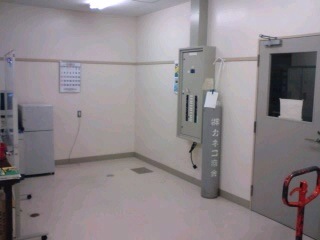 Miura-san went into our lab. We had a year-end party and enjoyed drinking at Tohya. We had a welcome party for Miura-san at Sajikiya. Ikoma-san,Wakikawa-san,Ambe-san and Kana-san had their research presentations at International Congress on Natural Sciences with Sister hood Universities 2012 in Taiwan. Kanno-san attended the Graduation Ceremony. Wakikawa-san and Kana-san had their research presentations at the Meeting of Japan Society for Molecular Science 2012 in Tokyo university. Toda-san and Ambe-san had their research presentations at the Annual Meeting on Photochemistry 2012 in Toukou university. Kanno-san did best perfomance on the graduation thesis presentation. Prof.Maeda visited our lab and talked about his research. Ambe-san and Ikoma-san attended the 3rd CREST meeting of progress reports at Tokyo. Ambe-san presented his interim report at a public hearing of chemistriy course of graduated school. We joined a joyful annual event Tatekon party of Chemistry Department. Congratulation on a happy wedding ceremony of Wakikawa-san. We wish you good luck in the future too. We took a kick-off meeting even under blackout due to a spring storm from the yesterday's midnight. All students moved to room 609-610 where we shared with Sato lab. Ikoma-san had a presentation at the organic spintronics symposium of the 92nd Annual Meeting of CJS. Ikoma-san visited Hasobe lab of Keio University. Kanno-san changed his room to 602 where Ikoma-san lives. Prof. Ohkita of Kyoto University visited to our lab and gave us a very interesting talk about OPV. Eri-san, Kana-san and Nishikawa-san (B4) might do their best perfomance on the graduation thesis presentation. Ambe-san and Toda-san presented their research works at the Joint Seminar with Pukyong National University and National Taiwan Normal University. Kobayashi-san presented his research work at the final examination of master course in front of a lot of professors. We celebrated a new year at YOTTEKU with four candidate members of our lab from the next semester. Kana-san and Ikoma-san visited Ito lab of Shinshu University and enjoyed discussion with the members of Ito lab. Ikoma-san had an intensive lecture on the fundamentals of organic solar cell at faculty of education, Shinshu University. At MURASAKI, we enjoyed a year-end party of several SMIS-labs. We cleaned up the experimental rooms that is a big event at year end. Ambe-san visited to Akiyama lab of Tohoku University and did ESR experiments there. Ikoma-san attended a symposium of JST at Akihabara that all the members of Tsutsui PRESTO gathered to present their research works. Ikoma-san had SSH lectures on demand at Kiryu high school where Kawata-san works as a teacher of chemistry. The lecture received a coverage in Kiryu Times. Ikoma-san attended a G-COE program symposium at Tohoku University. Ambe-san and Ikoma-san attended a SEST meeting at Sendai. Ikoma-san attended a CREST meeting of progress reports at Tokyo. Ikoma-san attended the 4th International Photonics and OptoElectronics Meeting at Wuhan. Ikoma-san had an intensive lecture of spin chemistry at Huanzhong University of Science and Technology at Wuhan. Our lab set up a booth with solar cell as theme on niigata university week. Welcome party of Kanno-san at Kangoshina. Prof. Okada of Yamagata University visited to our lab. Kobayashi-san, Wakikawa-san and Ikoma-san attended to aCREST meeting at Tokyo..
One B4 student has joined into our lab. Prof. Ikeda of Osaka Prefecture University visited to our lab and discussed about a magnetic field effect on his radical EL. Kuma-san and Ogiwara-san of IDEMITSU visited to our lab. Prof. Shiko of Osaka University visited to our lab and had an elegant lunch at Setsugetsuka. Prof. Akimoto of Wakayama University visited to our lab, said enthusiastically about i-pot, and was excited about a glass diffusion pump. Toda-san and Wakikawa-san had their research presentations at the 5th syposium on molecular science 2011 at Sapporo. Eri-san and Kana-san enjoyed a seminar journey to Kanazawa under a typhoon. Kobayashi-san and Wakikawa-san had their research presentations at the conference on photochemistry 2011 at Miyazaki. Congratulation on that Nishikawa-san, Kana-san and Eri-san have successed in the adimission exam. of the grad. school. Wakkikawa-san calmly presented an interim report of his research in front of a lot of professors. Approximately fourteen high school students vistied our lab this open campus. The latest net windows have been installed. Prof. Dr. Toshikazu Nakamura came to lab and gave a lecture and a research talk of “magnetic resonance of organic conductor”. Joined to a beer party of chemistry department. B4 students had made up a paper weight at a traing workshop of the machine shop. So everyone can use milling and drill machines. We had a drinking party after the completion of Lab Practice of Physical Chemistry including a special guest of Prof. Dr. F. Ito. We have fought in a tournament of softball game in chemistry department. Do not ask the result. A book of "High-energy chemistry" in which Ikoma-san contributes a chapter has appeared and adopts his important coceptual picture as its book cover. The 1st year students joined our lab tour in course of Study Skills. Laboratory Practice on Physical Chemistry 2011, which is a compulsory subject for the juniors (B3), began. Ikoma-san visited to Prof. Dr. Peter Bobbart and had a lecture at Department of Applied Physics, Eindhoven University of Technology. Ikoma-san attended to Spin Chemistry Meeting 2011 at Noordwijk and presented research work of Komagata-san. A review article of “Molecular Spintronics” by Ikoma-san has been published in Physica E.
Komagata-san and Dr. Nakata vistited us and shared their exciting experience at individual new work places. Ikoma-san attended a CREST meeting at Tokyo and had progress reports of Kobayashi-san, Ambe-san and Wakikawa-san. Wakikawa-san and Ikoma-san visited Prof. Akimoto of Wakayama Univ. and Prof. Masuo of Kwansei Gakuin Univ. We had a fellowship time with the 1st year students at Tate-kon. Kick-off meeting of our lab. Three B4 and one M1 students have joined into our lab. Our article (J Phys Chem A; 2008,112(37), 8641-8) has been selected as one of the top 10 articles published recently on the same topic based on MEDLINE. Toda-san (B4) had a nice perfomance at graduation thesis presentation. Ambe-san had a poster presention at Global Circus Symposium at Toki-messe. Kawata-san (graduate) has come and tell us how hard the teacher's job is in high school. Komagata-san (M2) successfully presented his master sythesis at a final exam. for master degree. Motoi-san (graduate) has visited us..
Professors of Pukyong National University visited to our lab. Wakikawa-san had a presentation at a Joint Seminar with Pukyong National University. Wakikawa-san got an offer of a research fellowship of JSPS from next April. Congratulation. A research work done by Wakikawa-san has been published in Small. Ikoma-san had a lecture at a seminar of Prof. Kido's group. Ambe-san, Kobayashi-san and Ikoma-san visited to laboratories of Prof. Nakayama and Prof. Hong at Yamagata University. They gained a wonderful training of OPV. Wakikawa-san was awarded a prize of excellent presenter in SEST2010. Komagata-san, Wakikawa-san and Ikoma-san have attended annual meeting of SEST2010 at Nagoya. We celebrated birthday of Jacob and Wakikawa-san with a lot of delicious foods Ambe-san cocked for lab members. We enjoyed Ojiya-soba at lunch time which is a gift from Takahashi-san. Ikoma-san introduced a research work of Wakikawa-san at a start symposium of Cooperative Education and Research Center for Green Chemistry. Ambe-san and Ikoma-san enjoyed a networking event for the international students in faculty of science. Ikoma-san has attended APES2010 at a mysterious Island Jeju. Komagata-san and Ikoma-san have attended Photochemstry Conference at stormy Chiba. Congratulation on Ambe-san's passing the admission exam. Ikoma-san has attended SPINOS-III at chilly Amsterdam. We had a happy evening party at a Japanese bar ONRAKU. Ambe-san had the admission examination for the doctral course of grad. school. Congratulation to the second baby of Aloha-san and Ambe-kun. Ambe-san had a good Japanese presention about his family at Nihongo Kyoshitsu Happyou-Kai. A lot of high school students have visited our lab. at the Open Campus. Prof. Toshikazu Nakamura (Institute for Molecular Science) visited and had a research talk about magnetic resonance for molecular conductors. We had a cool party together with the labs of organic chemistry. Toda-san passed the admission exam. for the master course of the grad. school. Two graduates of Suzuki-san and Yokoyama-san visited with their girl friends. BBQ party for "well done LP"
Wakikawa-san attended to ICSM2010 and met Hu-sensei again at Kyoto. We enjoyed the beer party of Chemistry Department organized by Kobayashi-san. Toda-san has come back from Sado High School where he had a good teaching practice. The first year students enjoyed our Lab. tour. Laboratory Practice on Physical Chemistry for the juniors (B3) has started. Toda-kun succeeded to observe a clear signal from a sample for the first time. Ambe-san of research student has joined in our group seminar. A fine night weather in April carried us to a YOZAKURA party in the campus with Iwamoto lab. and Tayama lab. At the annual TATEKON, Ambe-san had a debut in Chemistry Department and we could make a success of invitation of five new students who were interested in physical chemistry. On behalf of enrolled foreign students, Ambe-san had a speech at the entrance ceremony of International Exchange Support Center. One undergraduate (B4) and two graduates (D1 and M1) students have joined in. Graduation thesis presentation of the B4 students. 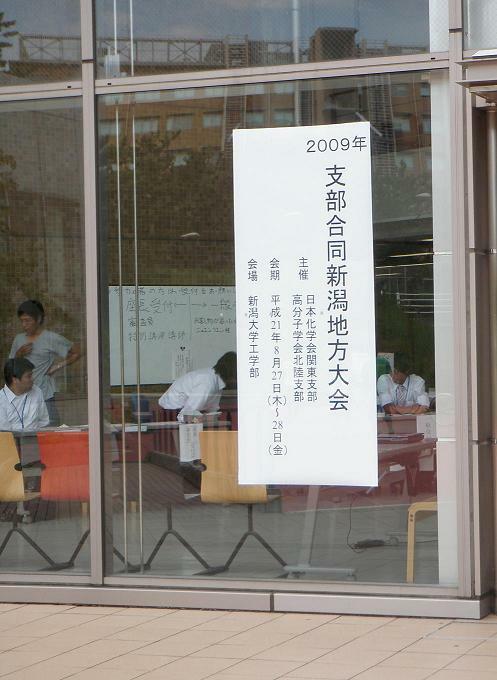 Kobayashi-san (B4) challenged the admission exam. for the master course of the grad. school. Wakikawa-san (M2) successfully presented his master sythesis at a final exam. for master degree. Two graduates came back to encourage the research works of the 4th year students. Heavy snow for the first time in about 30 years in Niigata. End-of-year party for SMIS-F6 at Shima. Dr. Fukushima taught us advances of molecular material chemistry and gave a lot of valuable suggestions for our researches. Due to Research Camp of Global Circus, we invited three researchers (Prof. Dr. Uy, Prof. Creencia and Prof. Ambe) of Chemistry Department of MSU-IIT in Philippines, had nice lectures and deepen exchanges. Wakikawa-san (M2) presented his research in SEST2009 at Kobe. Dr. Kiminori Maeda (Oxford Univ.) visited and had a research talk about migrations. Prof. Testuo Tsutsui (Supervisor of PRESTO-JST) visited. We discussed about the research project and the outlook. Prof. Bin Hu (Univ. of Tennessee) & Dr. Tsung-Hsun Lee (National Cheng Kung Univ.) visited our labo. and gave research talks at Nanospin Science Workshop. Wakikawa-san (M2) and Komagata-san (M1) had very nice oral presentations at the conference (Nanospin Science Workshop) at Niigata. Also we enjoyed a banquet with the J-semi members. Wakikawa-san (M2) and Komagata-san (M1) attended to the conference (International IMR Workshop on Group IV Spintronics) at Sendai. Website of APES links our laboratory. Takahashi-san (M1) made a debut and Wakikawa-san also had a oral presentation in the conference (Molecular Science 2009) at Nagoya. Komagata-san (M1) made a debut in the conference (Photochemistry 2009) at Kiryu. Laboratory practice of physical chemistry of this year was introduced by the University Movie. Nobody knows why Kobayashi-san promotes department of physics. Organization of international workshop on Molecular Nanospin Science developed by buit-up techonologies. Fujinaga-san and Ohta-san of JST visited from Fukuoka to discuss about the project & affairs. Ikoma-san presented the research of Yokoyama-san at Niigata Area Conference 2009. Wakikawa-san challenged the admission exam. for the doctoral course of the grad. school. B4 students challenged the admission exam. for the master course of the grad. school. Kobayashi-san and Kawada-san joined as presenter of our labo. at the open university for high school students. Ikoma-san had a research proposal interview at Institute of Science&Technology. Molecular Chemistry Seminar took place with Prof. Yukawa group this year, too. All stars of labo member together with the 1st year students participated in the softball game championship in the department. The pamphlet of faculty of science introduces our labo. again this year. BBQ party for "well done LP". Kawata-san has survived a hard teaching practice at Ota High School. Our labo. with Suzuki-san & Yokoyama-san has been introduced in University Pamphlet 2010 too. The first year students enjoyed our Labo. tour. Professional cameramen shot our experimental room for a promotion video of University Website. Laboratory Practice on Physical Chemistry for the juniors (B3) has started. All of our labo. members work as teaching assistants. Molecular Chemistry Seminar took place with Prof. Usui group. Abe-san (D1, Tohoku Univ.) visited for Labo. Tour and had a talk about Double Quantum Coherence ESR. Get-together for SMIS members at MURASAKI. At this TATEKON, no new candidate of our labo. could be recruited too. Wackey (M2) appeared on University Website. Visit of Prof. Chi-Feng Cheng (Chair of Department of Chemistry, Chung Yuan Christian University). Two undergraduate (B4) and two graduate (M1) students have joined in. At the graduation of 2009, Takahasi-san (B4) has received her diploma on behalf of the graduating class of the faculty of science. Open labo. for high school students. Wackey's (M1) debut in the international conference (SPINOS2009) at Salt Lake City. Ikoma-san introduced recent results of our group at the lecture meeting of Center for Quantum Materials Science. Ogiwara-san (IDEMITSU Kosan Co. Ltd.) came and discussed with Suzuki-san and Takahashi-san about their works. Unique students of Takada high school experienced the experiments of molecular spectroscopy at our laboratory as a SPP coursework supported by JST. High school students came at the open laboratory. A research paper of Cu-bisimpy has been published on the website of J. Phys. Chem. A. A B4 student challenged the admission exam. for the grad. school. Komagata-san again joined as presenter of our labo. at the open university for high school students. Takahasi-san and Komagata-san explained our labo. to a lot of high school students at the open facutly. Yokoyama-san visited to Prof. Okada (Yamagata University) for learning how to synthesize polydiacetylene and to drink sake. A lot of stududents of Niigata Daiich junior high school came and observed the LP. No reason for the beer party. Two B4 stududents challenged the admission exam. for the grad. school. Laboratory Practice (LP) on Physical Chemistry for the juniors (B3) has started. Our labo. with Suzuki-san & Yokoyama-san has been introduced in Faculty Pamphlet 2009 (10MB). Molecular Chemistry Seminar took place with Prof. Yukawa group. The freshmen of the department of chemistry (B1) visited to our group as part of Study Skills. OHANAMI at Uchino primary school. Move of experimantal room to a wider space equiped with a He recovery line. Four undergraduate (B4) and two graduate (M1) students have joined in. Molecular Chemistry Seminar took place as an open seminar. Dr. Kiminori Maeda (Oxford University) visited our labo. and gave a lecture. Prof. Markus Wohlgennant (University of Iowa) stayed and exchanged the ideas about spin effects in organic solid recently observed at our labo. Molecular Chemistry Seminar took place as the 28th colloquium at Faculty of Science. Prof. Testuo Tsutsui (Supervisor of PRESTO-JST) visited and discussed about the research project at our new labo. A crane has carried up experimental setups on the 6th floor where the labo. is. Molecular Chemistry Laboratory has begun from 0.